A) The excavation at Jonzac. The Quina Mousterian bonebed is concentrated in the area in the lower right corner of the photo. B) Close-up of the bonebed during excavation. The deep trench was excavated by Airvaux (1998–2003), and the surrounding bench was excavated during the current project (2004–2007). 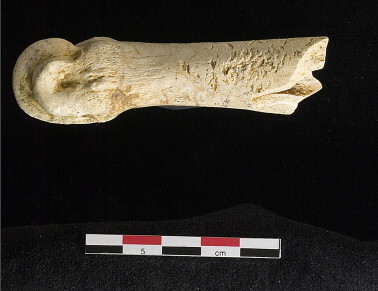 C) Many skeletal elements, including this reindeer elbow, were found still in articulation. Site photos courtesy of the Jonzac Project. Abstract: Neandertals were effective hunters of large ungulates throughout their geographic and temporal ranges. Equipped with this knowledge, researchers in paleoanthropology continue to seek insight on the relationships between hunting and subsistence strategies with other components of the Neandertals’ niche, such as mobility, site use, and lithic technology. The Quina Mousterian deposits from the rockshelter site of Chez Pinaud Jonzac (Charente-Maritime, France; hereafter Jonzac) offer an excellent opportunity to pursue these issues. This paper focuses on the extensive and well-preserved skeletal remains of reindeer (Rangifer tarandus) recovered from recent excavations of the site, representing at least 18 individuals that were hunted by Neandertals during the fall through winter. Our zooarchaeological results indicate that all ages of reindeer were hunted but adult individuals predominate. No bias is evident in the comparable frequencies of males and females. These prey were butchered on-site, with abundant evidence of meat filleting and marrow exploitation. A distal metatarsal (G9-1453) of a reindeer showing damage characteristic of having been used to retouch stone artifacts (retouchoir). Photo by Steffen Lätsch. In the excavated sample, the absence of hearths and the almost complete lack of burned bones or stones suggest that Neandertals were not using fire to assist with processing the reindeer carcasses. The zooarchaeological results presented here indicate that reindeer were hunted during a restricted window of time when they were seasonally abundant in the local area near Jonzac. Taken together with the lithic industry based on bifacial elements, the evidence is consistent with a pattern of site use by highly mobile hunter-gatherers making frequent, short-term visits. Ongoing research at Jonzac and other Quina Mousterian localities will contribute to a better understanding of Neandertal behavior during cold climate phases.